Synopsis: A dramatization of the 1980 joint CIA-Canadian secret operation to extract six fugitive American diplomatic personnel out of revolutionary Iran. The film also satirizes the Hollywood film community and what it took for the CIA to get their help in the operation. Review: The film directed by its’ star, Ben Affleck, is based on the true events that occurred during the Iranian Hostage Crisis. Jimmy Carter was President when the American Embassy in Iran was seized during the Iranian Revolution by militants, taking sixty hostages as six American Ambassadors, barely made it out. The six Ambassadors took refuge in the Canadian Embassy and were stuck there hoping they wouldn’t get caught. The Ayatollah Khomeini, who was the leader of the Iranian people at the time, had blamed the ill’s of the country on American intervention. Victor Garber plays Ken Taylor, the head of the Canadian Embassy in Tehran, and knowingly puts himself and his family at risk by taking in the Ambassadors before they are found out. The CIA works feverishly to intervene and even brings in Tony Mendez (Affleck), their chief operative in charge of hostage extraction to figure out how to get the six out. Mendez calls on his friend the make-up artist for the Planet of The Ape movies, John Chambers, who has helped the CIA with cover identities, to help here. Chambers is the one who comes up with the idea that Affleck would go in an as a Canadian film location scout. He also came up with the idea that the six hostages can have fake Canadian passports and pose as production crew and director. Goodman introduces Mendez to aging film producer Lester Siegel, (Arkin) who buys into the lie and uses the Hollywood machine to fake a fake movie production. The film they use is a science fiction script called ARGO and they even set-up a fake Hollywood production office with phone, movie posters and files. I might add the irony of all this is that it is paid for by the U.S. Government. Goodman and Arkin add a light-hearted and often hilarious touch to the art of Hollywood film makers and producers. The film is a taut, edge of your seat drama, that recreates actual events as they happen. You have to ask yourself how taken by America’s Hollywood the Iranians are that they fell for the cover hook, line and sinker. The film is a winner by any standard and Affleck possibly directed the finest film of the year. It will be a disappointment if this film doesn’t pick-up a nomination for best-picture or best supporting actor for Arkin. Arkin is brilliant at sarcasm, when a collegue asks him what ARGO is about he growls, “ARGO f*&%$k yourself!” Which does become a wink and a nod between Mendez and his Hollywood friends. Stay for the end credits because there are pictures of the Actors and the their real world counterparts shown side by side as President Jimmy Carter, in Voice-Over, discusses the actual ARGO operation and the facts surrounding the events. Synopsis: Jerry Mulligan, a struggling American painter in Paris, is “discovered” by an influential heiress with an interest in more than Jerry’s art. Jerry in turn falls for Lise, a young French girl already engaged to a cabaret singer. Jerry jokes, sings and dances with his best friend, an acerbic would-be concert pianist, while romantic complications abound. 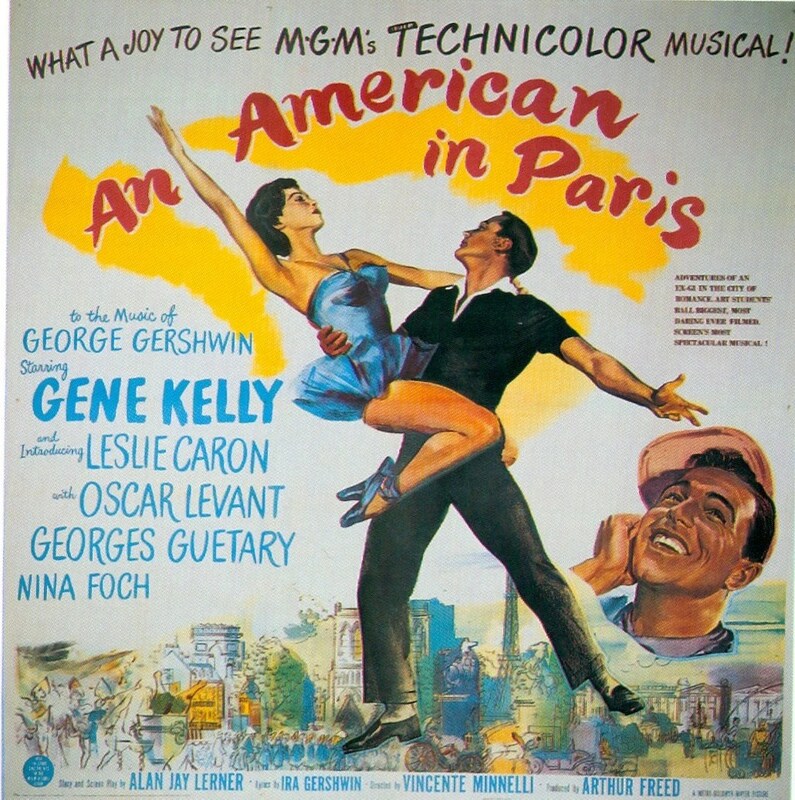 Review: This Vincente Minnelli directed, Gene Kelly/Stanley Donan choreographed MGM musical is a moving, ground breaking, love poem to artistry and romance. First off the clarity and color of the Blu-Ray disc is astonishingly clear. The restoration and high definition picture draws you in and you start to notice details such as the paint on the Parisian walls etc. in crisp detail. This film won the Academy Award for Best Picture after it’s release in 1951. The winning score by George and Ira Gershwin sweeps you away with songs like, S Wonderful, Our Love is Here to Stay and I’ve Got Rhythm. There is something undeniably sublime in watching everyman dancer Gene Kelly, painter Jerry Mulligan, at work here. His roots as a dance instructor in his family’s dance school is in evidence as he works with the children in the I Got Rhythm number. He is delightful and enchanting and the children follow him in grand amusement in hopes of getting some American Bubble Gum. Leslie Caron a dancer who was trained in Ballet makes her film debut here and it is her charisma and dance craft that carries her through the film. She almost floats as she dances with Kelly in Our Love is Here To Stay. Her charm and warmth appeals every time she smiles. Georges Guetary plays singer Henri Baurel, who is engaged to Lise, he is unaware that his friend Jerry Mulligan is in love with her. Guetary’s big number Stairway to Paradise, showcases his singing talents amidst a large lighted staircase and a bevy of beautiful MGM girls. The song is done with artistry and never crosses the line into gaudiness. Nina Foch plays suntan oil heiress Milo Roberts. She falls for Mulligan and wants to promote his paintings in a legitimate art show. Mulligan at first balks because he doesn’t want Robert’s affections. The relationship never really gets off the ground because Mulligan is truly in love with Caron’s character Lise. The most celebrated sequence in the film is Kelly’s choreographed 17 minute ballet. The uniqueness of taking famous french artist’s paintings and bringing them to life with Paris as the background, is contemporaryand brilliant. The ballet tells the story of Mulligan’s love for Lise. Kelly smoothly transitions from ballet, tap and jazz dance throughout the 17 minutes. One gets caught up in the sequence’s use of color, music and dance. The disc includes a few extras such as the PBS produced American Masters Episode: Gene Kelly Anatomy of a Dancer a vintage MGM Fitzpatrick TravelTalk short, Paris on Parade and a classic MGM cartoon Symphony in Slang. Overall this is a must have film for anyone’s cinema collection. Synopsis: Set in the near future, Frank, a retired cat burglar, has two grown kids who are concerned he can no longer live alone. They are tempted to place him in a nursing home until Frank’s son chooses a different option: against the old man’s wishes, he buys Frank a walking, talking humanoid robot programmed to improve his physical and mental health. What follows is an often hilarious and somewhat heartbreaking story about finding friends and family in the most unexpected places. Review: Jake Schieier directed this charming film using speculative fiction as his story telling device. For those uninitiated, speculative fiction takes what we already know exists in science and speculates what it would be like in the near future. Sort of not quite sci-fi but closer to scientific reality when applied. The story centers around ex-cat burglar Frank, (Langella) who lives alone in his house, in a small suburban community. It is apparent he is beginning to lose his short term memory. His daily routine consists of going to the local library where he has a friendship with the librarian, Jennifer (Sarandon) then going to a local nick-knack store and swiping small things like soap shaped like a cat. His son Hunter (Marsden) tolerates his father’s behavior but can’t let his father live alone. Hunter is particularly alarmed when Frank doesn’t remember him or his daughter Madison (Tyler). To remedy the situation Hunter, against his father’s wishes brings him a companion Robot. The Robot is specifically designed to challenge Frank’s mental abilities, keep Frank active in a positive way and cook Frank’s meals. In short Hunter had the robot programmed to keep Frank out of trouble. The Robot even starts a vegetable garden in the backyard of the house. We learn along the way Frank was indeed a convicted and did jail time on burglary charges. When Frank finds out a wealthy entrepreneur, Jake wants to convert the library into an interactive community space with no books just computers, he decides to start cat-burgling once again. He trains the Robot to help him case the rich Jake’s house in hopes of stealing a valuable diamond necklace owned by Jake’s wife. The Robot at first won’t comply, but sly Frank convinces the Robot that a burglary will be good to stimulate his mental faculties. The Robot acquiesces and the two of them go on a caper. The Robot/Frank bonding begins when Frank trains the Robot how to pick locks and avoid alarms. 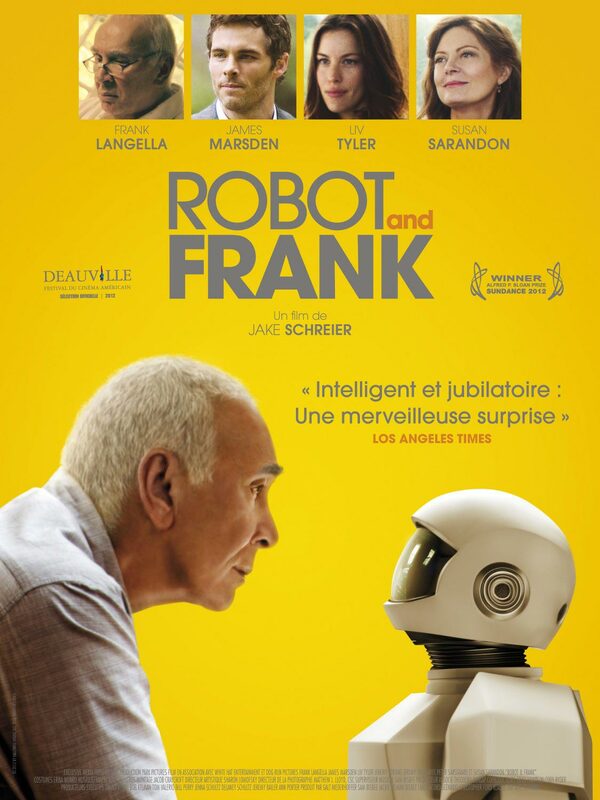 We watch with a knowing smile as the relationship between Frank and the Robot turns to respect and friendship. When Frank’s daughter Madison suddenly appears to take care of Frank, she is against Robot technology, her shutting down the Robot causes Frank to freak-out as the heist date draws near. When after some sly outmaneuvering by Frank, Robot gets turned back on and the heist goes as planned. You wonder how far gone Frank really is when Jake and the town sheriff come to question him about the heist and the goods can’t be found in the house. The Robot shows the human sign of self-sacrifice when he suggests that Frank erases his memory so the police can’t access his memory of the heist. The story is funny, heartwarming, quirky and a winner. Speculative fiction aside this is a fun movie with a great cast. Langella really knows how to maneuver between loss of memory and slyness. His performance was wonderful to watch. Synopsis: Nicholas Jarecki makes his directorial debut with this taut and alluring suspense thriller about love, loyalty, and high finance. Arbitrage buying low and selling high depends on a person’s ability to determine the true value of any given market. It’s a talent that has made billionaire hedge fund magnate Robert Miller the very portrait of success in American business. But on the eve of his sixtieth birthday, Miller finds himself desperately trying to sell his trading empire to a major bank before the extent of his fraud is discovered. When an unexpected bloody error challenges his perception of what things are worth, Miller finds that his business is not the only thing hanging in the balance. Review: In his directorial debut Nicolas Jarecki puts together a tight, suspenseful, thriller. The film is not only a throwback to the Hitchcock way of story telling but also reflects the Bernie Madoff’s of our modern society. The question becomes can billionaire investor Robert Miller, played by Richard Gere, get away with manipulating the books to make a 415 million dollar mistake disappear while not being accused for his involvement in an accidental murder on the eve of his corporation being sold? The drama centers around the Robert Miller’s family run firm, Miller’s daughter Brooke, played by Brit Marling is the firm’s chief accountant and the first to notice the 400 million dollar discrepancy in the books. Robert Miller of course has a second set of books and dismisses his daughter’s accusations by telling her this can’t be I’ll have to check in to this. The reason for the cooked books is to show the firm, which is about to buy him out, that everything is OK and they will pass all the Wall Street compliance rules. Miller is also a philanderer, his much put upon wife, played by Susan Sarandon puts up with it by convincing herself this is just part of who her husband is. She is content to spearhead her charities and live the life of mother and corporate housewife. It is obvious that Robert Miller cares only for himself and his firm and has little feeling for his family or the consequence of his behavior. Julie Cote, played by Laetitia Casta, Miller’s lover owns an art gallery set up by Miller Investments. She also lives in a corporate apartment owned by Miller’s firm. On the eve of the corporate buy out Miller and Cote have a tryst that ends up in a deadly car accident with Miller falling asleep at the wheel. Not wanting to be caught, Miller leaves the scene of the accident with his dead girlfriend in the car. We see the car explode in flames as he walks to a pay phone, not wanting a trace on his cell, and calls a family friend to come and get him. The friend is Jimmy Grant the son of his former personal driver. Jimmy comes out of loyalty to Miller. The police arrive and from the get-go Police Detective Michael Bryer, played by Tim Roth, is out to incarcerate Miller with any means at his disposal. Roth plays hard-boiled and frustrated to the hilt. Gere is cold and calculating and plays the part with precision. Susan Sarandon plays her role with conviction, when she learns the facts, her disillusionment is real and telling. Brit Marling plays the trusting daughter and her feelings of being betrayed are palpable. Marling has to navigate between love for her father and her duty to turn him in for fraud. Laetitia Casta has very little to do here but serve the role as lover, which she does. Nate Parker is the breakout star here and plays Jimmy Grant the possible fall guy for Miller. He holds in his hands the confession that would convict Miller.